1. Bring a large pan of salted water to the boil. Add the linguine, cook for 7 minutes, then add the asparagus and simmer for 2 more minutes. Scoop out a large cup of the cooking water, then drain the pasta and asparagus. Meanwhile, whisk together the lemon zest, juice and oil with the bashed garlic clove in a small bowl. 2. 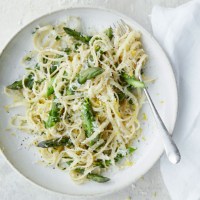 Tip the drained pasta and asparagus back into the pan with the pecorino, parsley, lemon-oil mixture and a good glug of the cooking water. Toss together, discard the garlic, and season. Serve immediately. This recipe appeared within the May 2018 recipe card collection.